BYUtv hires a new cast for ‘Studio C.’ It’s more diverse and less BYU-centric. 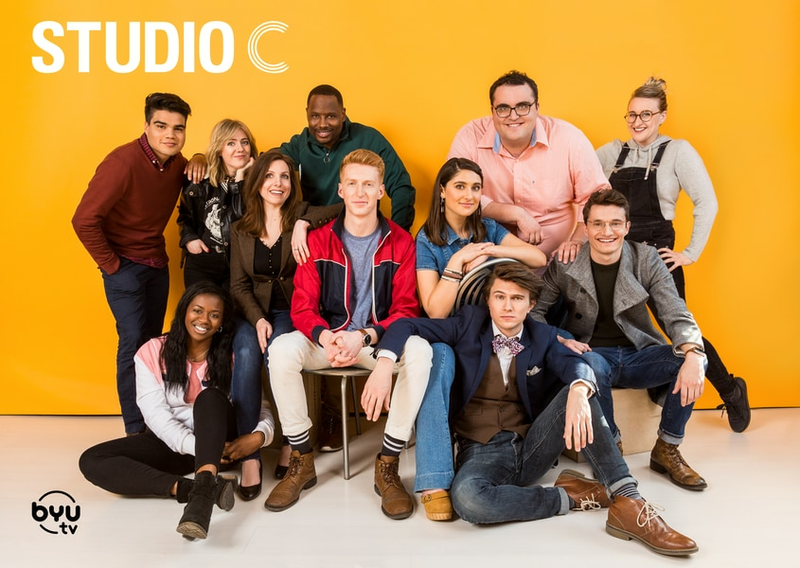 (Photo courtesy BYUtv) The new cast of BYUtv's sketch-comedy show "Studio C."
BYUtv has hired a new cast for its most popular show, “Studio C,” and things will clearly be different going forward on the sketch-comedy series. The new cast is somewhat more diverse than the original. Three of 11 members of the new cast are people of color; two more than the original 10-member cast. As was the case when the show premiered in 2012, the “Studio C” cast is populated by unknowns. This time around, however, it’s less BYU-centric. A nationwide casting call went out, and only one of nine new cast members is a Brigham Young University student. Garet Allen, a BYU media arts student from Utah, is a former member of the BYU sketch comedy team Divine Comedy. Jessica Drolet, from Quebec, has performed with the Upright Citizens Brigade, The Pack and Groundlings, and is a former member of the house sketch team Tantrum at the Pack Theater in Hollywood. Ike Flitcraft, from New Jersey, has performed with the Upright Citizens Brigade, iO and Second City. He studied at Belmont University. Matthew Galvan, from California, is a film directing and acting major at John Paul the Great Catholic University in Escondido, Calif.
Arvin Mitchell, from Missouri, has done stand-up comedy around the world, including Spain, Africa, Germany, Italy and England. He was a finalist on NBC’s “Standup for Diversity,” which searches for diverse talent. April Rock, from Connecticut, has performed with Upright Citizens Brigade, Second City and John Rosenfeld Studios. She studied at Pepperdine University. Austin Williams, from Tennessee, has performed with the Upright Citizens Brigade, iO and Second City. He studied at Belmont University. “We have assembled an incredible combination of talent for ‘Studio C’ Season 10 and are thrilled to renew our commitment to sophisticated comedy that delivers to all ages and every member of the family,” said Michael Dunn, managing director of BYUtv. Season 10 of “Studio C,” featuring the new cast, will premiere in the fall.